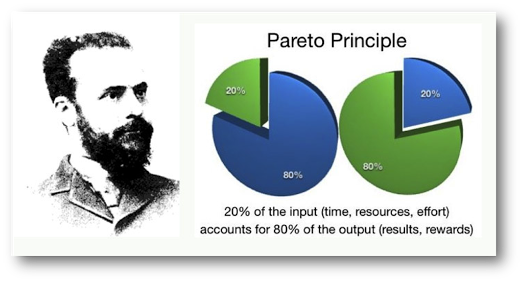 How Pareto Principle Works in Marketing? 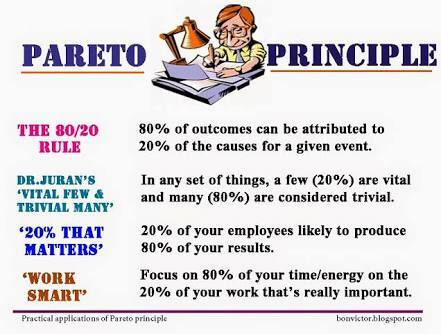 Do you’ve heard of the Pareto Principle. But do you understand it? It goes under various monikers: “the 80-20 Rule,” “the Law of the Vital Few” and “the Principle of Factor Sparsity.” It has far-reaching implications. And its idea is simple, yet profound: 80 percent of the effects come from 20 percent of the causes. Its genesis, interestingly, was a revelation about Italian land-ownership patterns: Italian economist Vilfredo Pareto (1848-1923) discovered in the course of his research that most of his nation’s land, around 80 percent, was owned by just a few powerful people: 20 percent of the population. As pervasive as the Pareto Principle may seem, however, it’s not a magic trick. It’s a principle, not an inviolable law of the universe. More precisely, it’s a trend — something that happens most of the time. Yet, because it’s so simple and easy to understand, it is applied indiscriminately to vast areas of life, business and human activity. Some businesses have fallen prey to the Pareto trap, making major pivots that are supported only by a flimsy principle rather than real and actionable data. Writer Dave Lavinsky has explained that “The Pareto Principle scales to the third power and fourth power, and so on, when the numbers are great enough.” Marshall says that it is infinite. Find out where those 20 percent come from — the traffic channels that they discovered, the ads on which they converted and the content with which they engaged. Optimize, enhance and promote that content. You should stop spending inordinate amounts of time on the few customers who spend paltry amounts. Focus on your best customers — and that will usually mean only around 20 percent of them. Previous Post How To Find Out Exact Optimization For Your Site With Company/ Customer Focused Navigation? Next Post Are You Happy With Customer Reviews? Try This For More Positive Reviews.